In the modern World, a well-structured website stuffed with useful content is an indicator of any company. The attorney niche is not an exception so any self-respecting lawyer needs a polished website to represent skills with dignity. You might think website creation is an uncomfortable exercise which requires investment and you’d rather use good old television and radio promotion. However, this way of advertisement has seen a decline in relevance and being actively replaced by Internet promotion. You won’t find a better device than a website to increase the volume of sales or engage more clients. This is a beautiful tool that is able to gather all your professional skills and convert them into income. Recent days, it is not a big deal to launch a website since the WEB offers lots of gorgeous ready-made solutions. We are sure that you have heard about WordPress, which is the most popular and easy-to-use Content Management System. Therefore, the collection of versatile lawyer WordPress themes would come in handy for an attorney services representation. 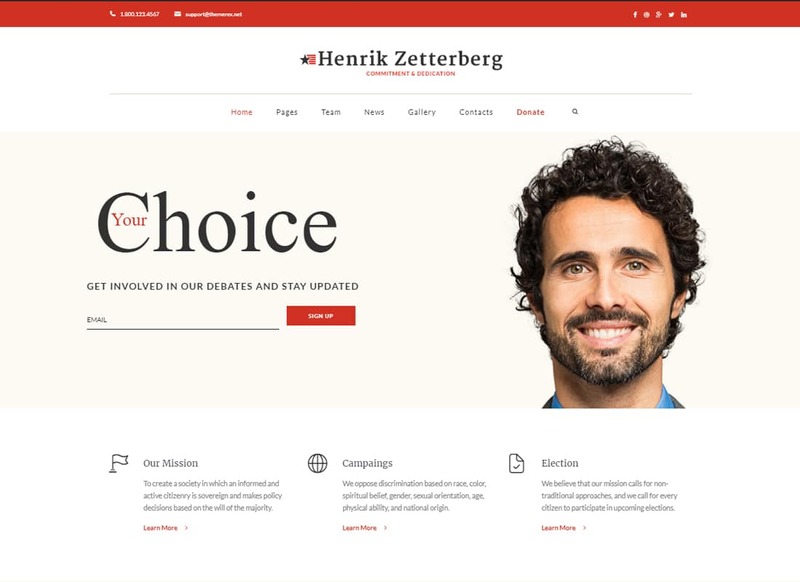 Below, you will find crisp and responsive WordPress themes for a lawyer, legal advisor, finance specialist, business consultant, accounting services, virtual assistant, insurance bureau, investment company, election campaign, political candidate, cryptocurrency blog, and much more. If you are looking for a new way to impress clients with your skillfulness and competence, this roundup will definitely inspire you. 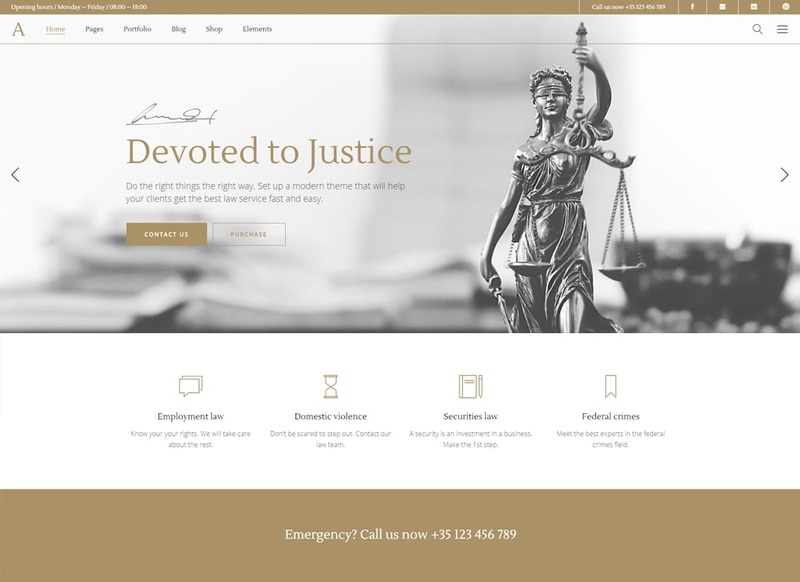 Using Justitia WordPress theme, you can build a remarkable online presence for lawyer and attorney agency websites. It features a straightforward and fully responsive layout that provides for an impressive presentation of your site’s data in all web environments. There are three different homepage layouts included in the theme’s download package. A rich collection of pre-made pages and layout options allows you to adjust the theme to fit various needs and purposes. A fully editable structure of the theme’s pages lets you craft an absolutely unique website as you work with a pre-designed template. You can enhance the theme’s performance just the way you want due to its compatibility with all popular WordPress plugins. 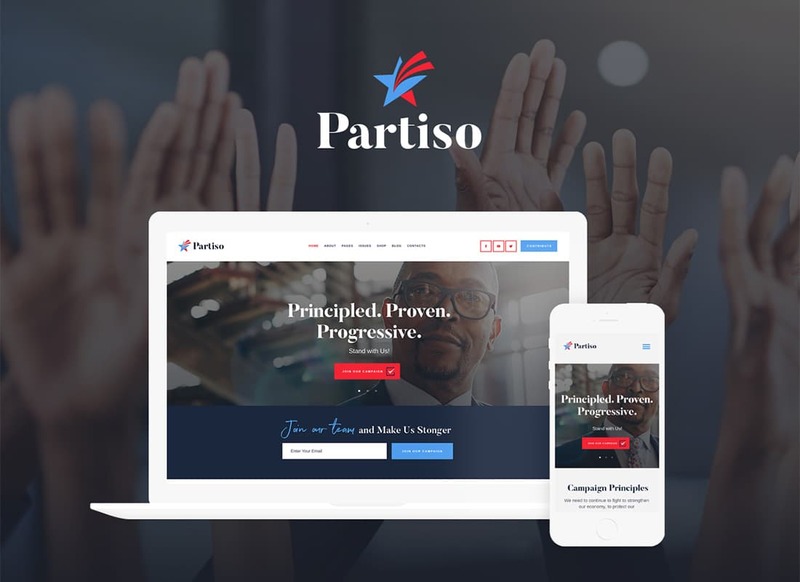 Partiso is a multi-purpose WordPress theme that’s perfectly suited to be used for political party and election campaign websites. A flexible and fully editable layout of the theme covers a range of popular topics like charity, human rights, volunteers, fundraising,events conferences, politics, testimonials, etc. 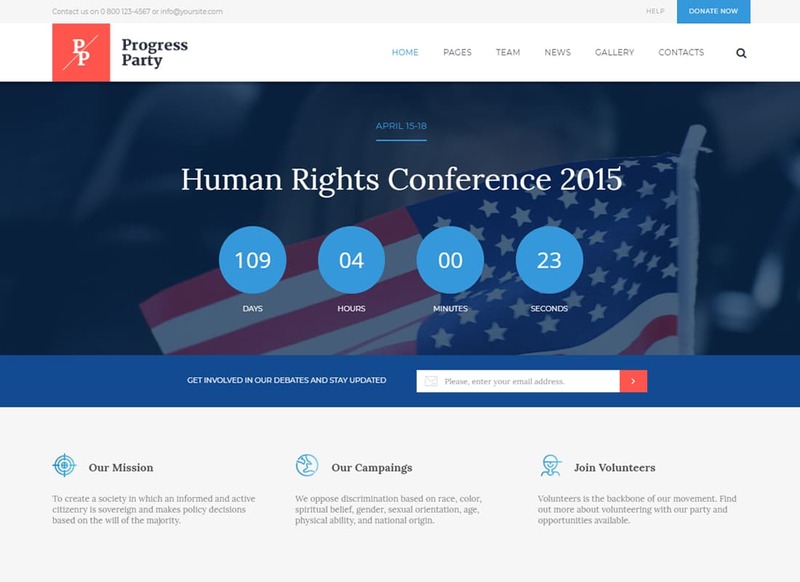 It comes loaded with 3 homepage layouts that are intended to deliver a personalized presentation to political websites. A modern design of the theme runs on the powerful ThemeREX framework. It is integrated with Elementor page builder that allows you to personalize its layouts in the drag-and-drop mode. It includes 20+ portfolio and blog layouts, as well as 80+ premade shortcodes and widgets that you can use during the theme’s customization. 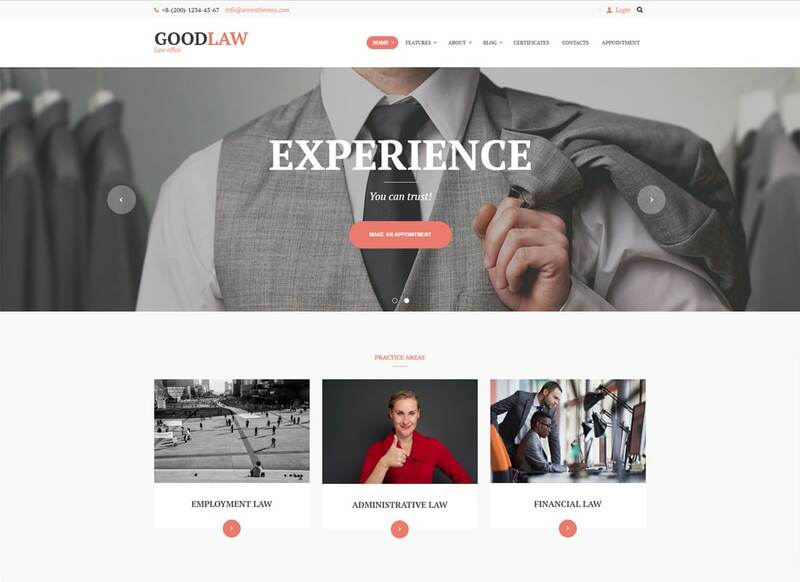 GoodLaw is a powerful and responsive attorney WordPress theme, that has flexible layout settings and a bunch of ready-made options for lawyers websites. For example, it features predefined lawyer practice areas, departments, certificates, team, and lawyer single page. 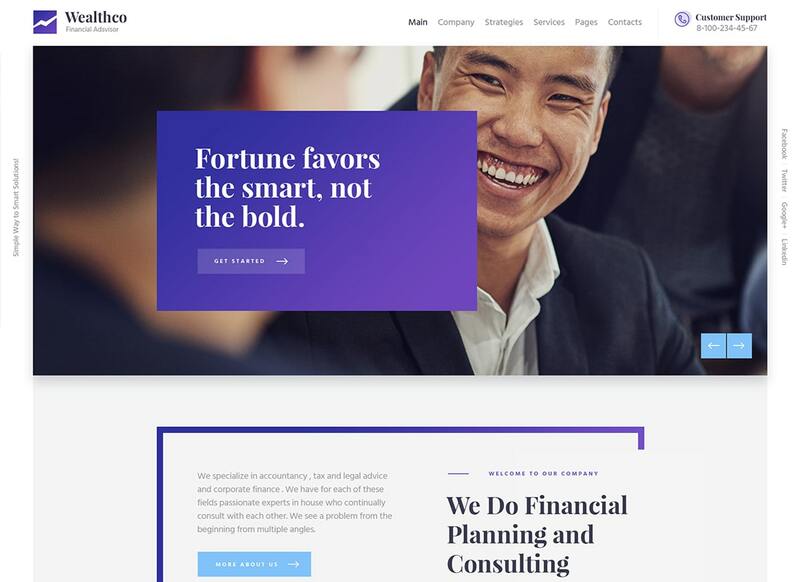 It doesn’t matter if you are a sole provider of lawyers services of an advisors agency, this theme fits great your website. 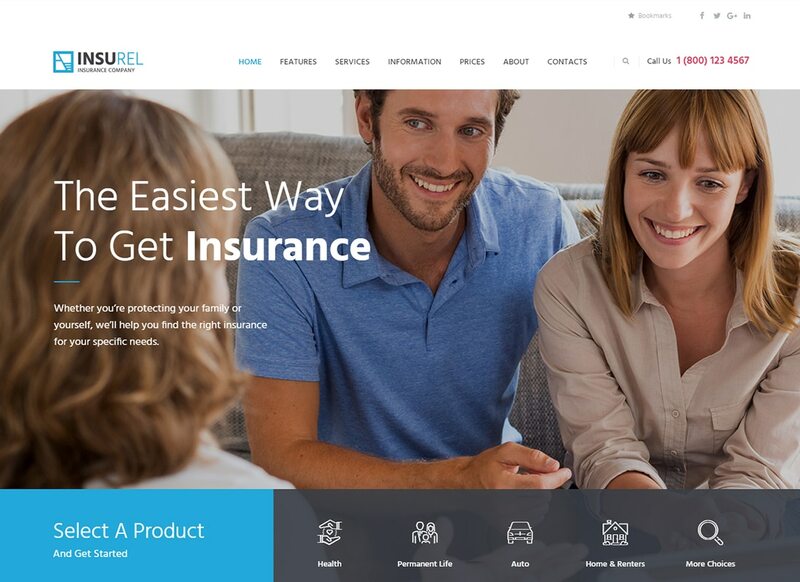 InsuRel theme is intended to save your time when designing the website. It comes with 4 pre-designed homepage layouts suitable any corporate website. Discover the simplicity of codeless content creation with Gutenberg composer. InsuRel theme comes with flexible blog functionality so you can represent your content in an incredibly fascinating way. As lots of attorney and law office WordPress themes, this one is fully-responsive and Retina-ready. The theme has an Appointments Calendar, which allows you and your clients organize the schedule. Dixon & Lamber has a theme options admin panel. You can customize typography, change the theme color, create columns, use buttons, etc. 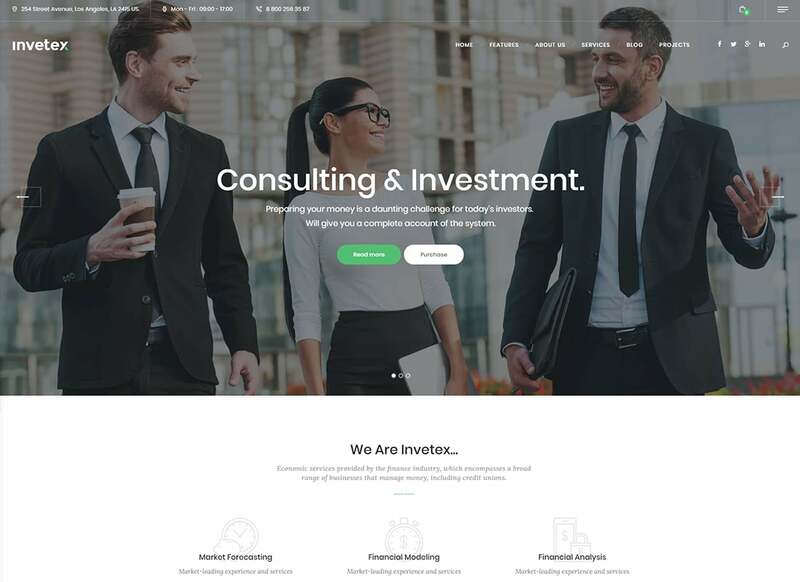 Invetex is a contemporary consulting theme. It has a multi-purpose design which, moreover, is RTL-ready. It means you can translate content into multiple languages. It is easy to establish trustworthy relationships with the customers using such theme as it has advanced contact forms, “request a quote” option, online appointments booking, and lots of other options that will simplify your visitors' life. M.Williamson the fast and elegant WP theme. 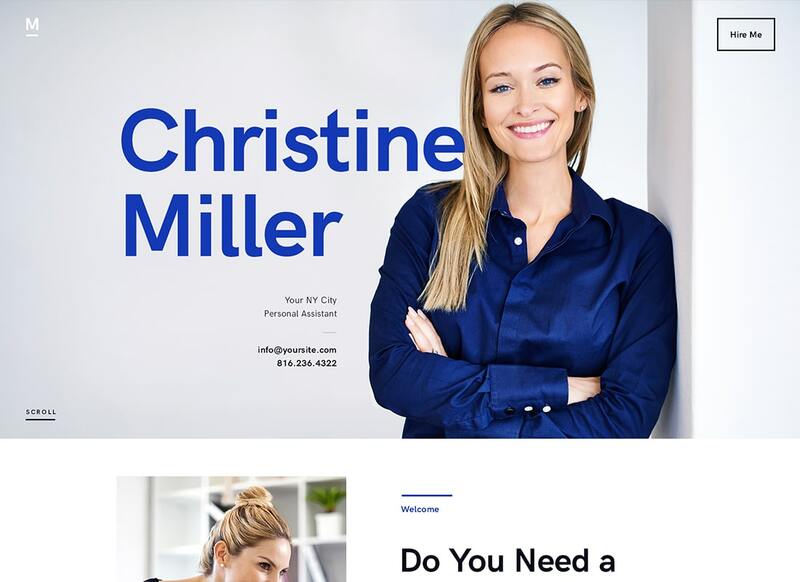 This is one of those attorney and law WordPress themes that could be used by the financial niche representative. This theme has superb navigation, 2 menu variations (Classic/ Pop-up), “scroll to top” button, and interactive Ajax search. M.Williamson theme is optimized for search engines and ready for work in all browsers. 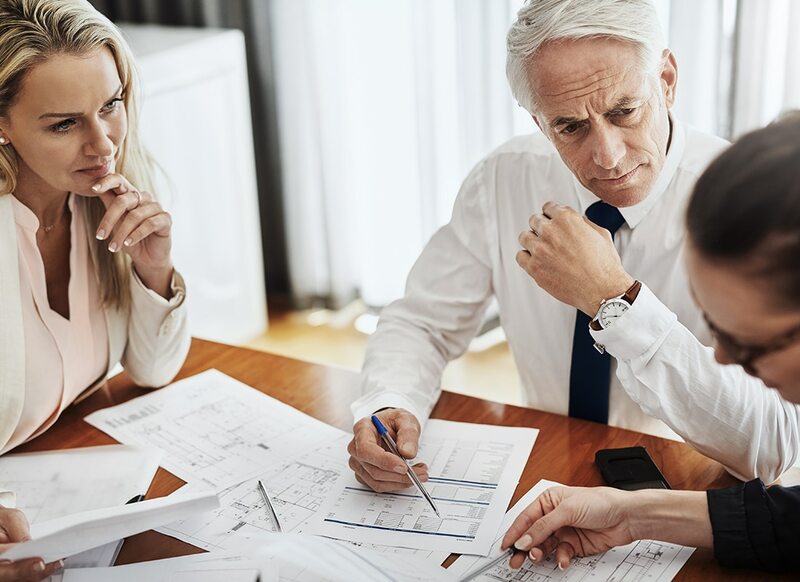 Are you a professional financial advisor? 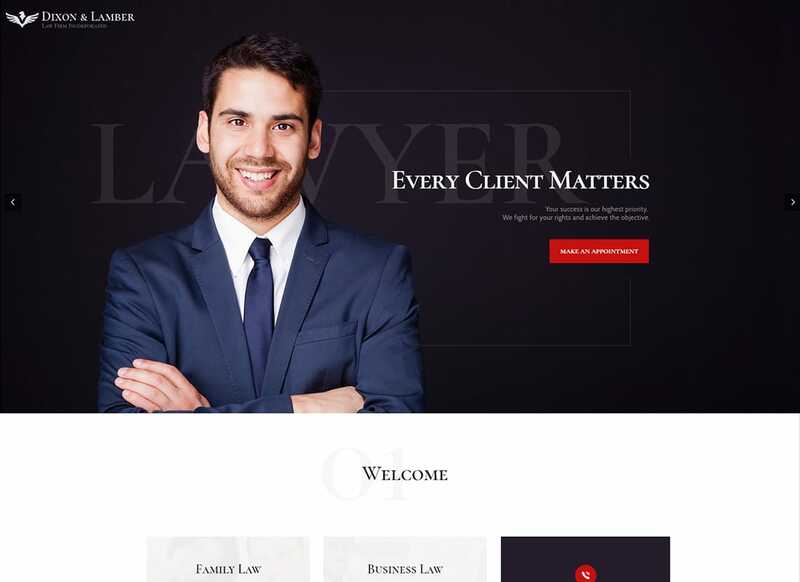 In this collection of versatile attorney and law office WordPress themes, you will find lots of gorgeous designs for your website. This one has a minimal responsive design which will adapt your content to all devices. It is a great piece for those, who want selling services or products by means of the website since it is compatible with the WooCommerce plugin. 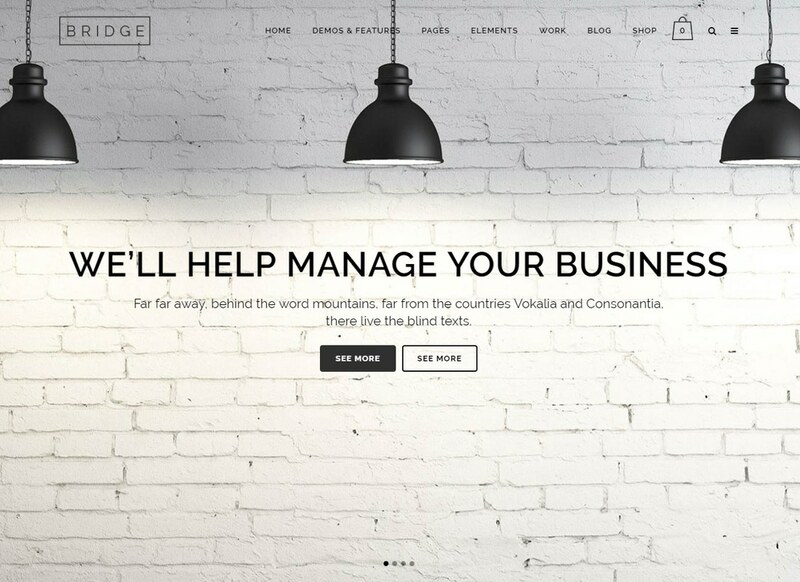 Embellish the dull corporate website with this fresh theme. If you want your website to look modern and classy this Law Office WordPress theme will make your desires a reality. The Law Office theme comes with BBB accredited labels, online booking appointments system, attorney profile single page, and the events manager. It is a highly customizable theme with numerous headers, menu configurator, 15 variations of a portfolio, ThemeREX framework, WPBakery composer, and shortcodes builder. 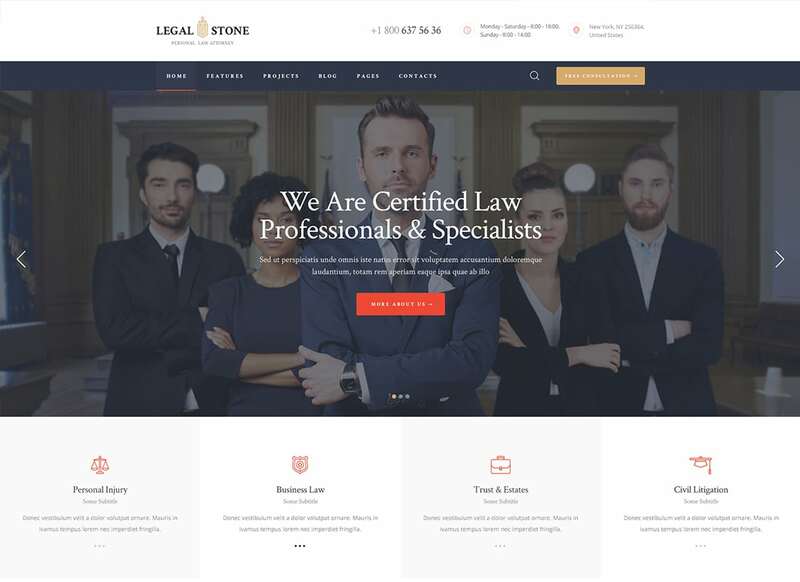 Legal Stone is a great theme for legal consultants, lawyers, attorneys, advocates, and other representatives of law-related companies. It comes with a modern and stylish layout aimed to showcase your services in a beautiful way. With Legal Stone, you can launch a legal online business since this theme is General Data Protection Regulations ready. And business needs consultors assistance once in a while as well as any business consulting website needs this theme. This theme is supported with shortcodes and widgets. 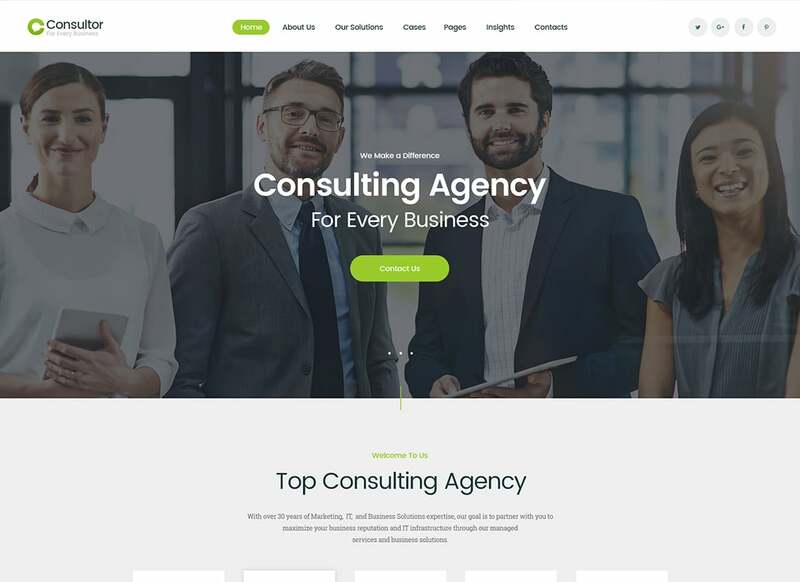 Consultors is an SEO-ready theme and will make the best impact on your project. Anybody can craft the website from the scratch whether they have a frontend experience or not. This theme gives you an amazing opportunity to monetize your accounting skills. 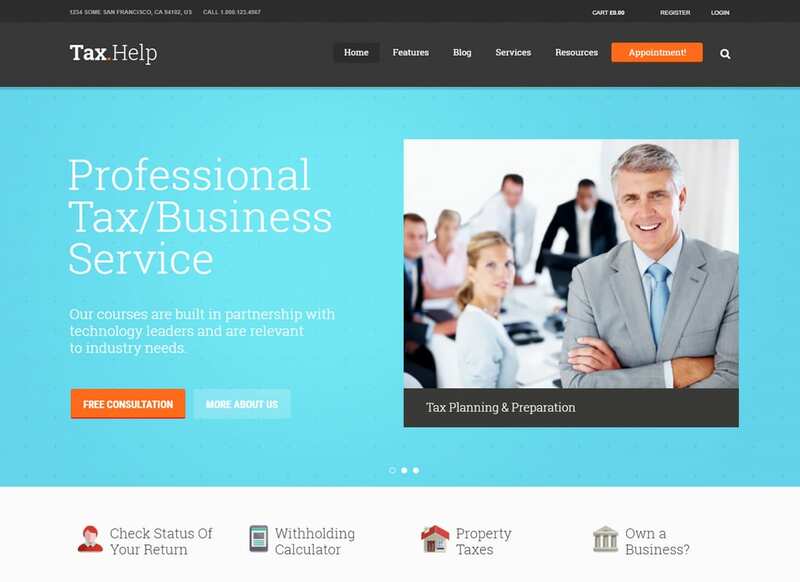 Tax Help theme looks amazing on all devices. Also, you can change its design using shortcodes and drag and drop content creator. Superb data install mechanism allows to skip the installation process and creates a copy of the demo in a single click. 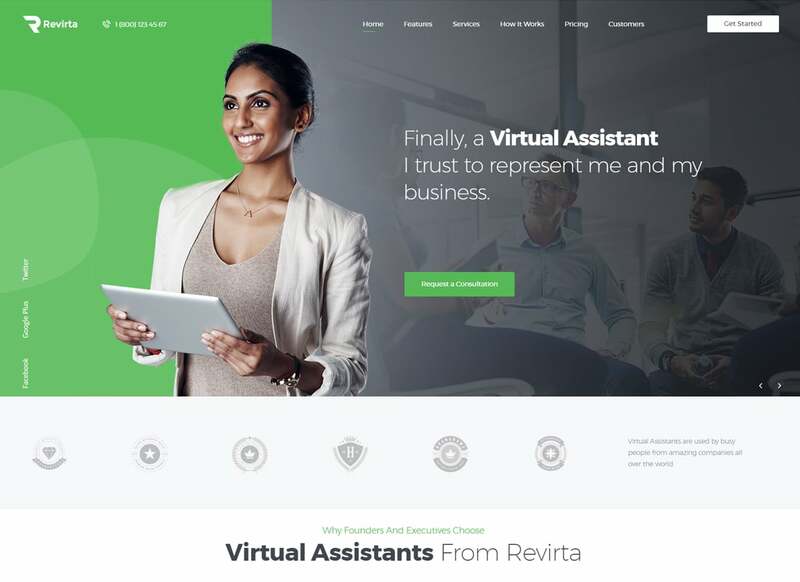 Revirta serves a perfect web design solution for a virtual assistant website. It includes 6 homepages on different topics. A wonderful free addition to this theme which lots of other lawyer WordPress themes lack is ThemeREX Add-ons plugin. By means of this tool, you can customize the header and use custom post types. 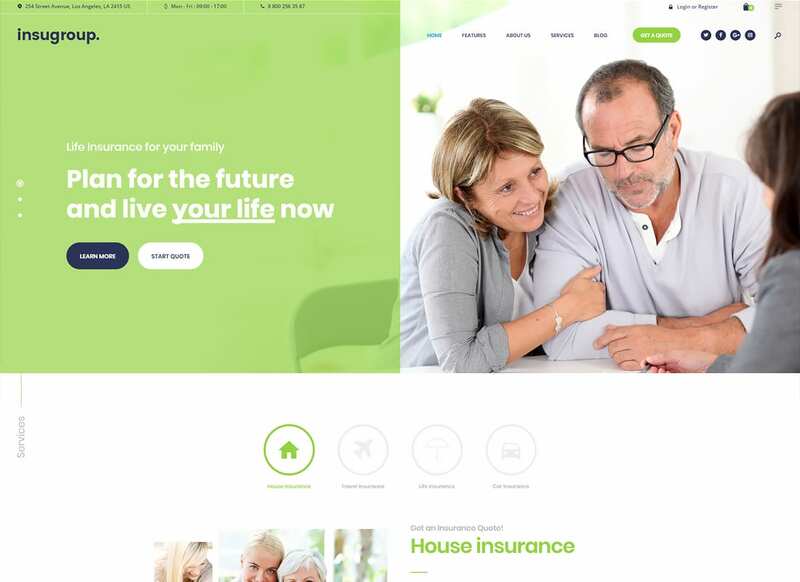 Insugroup theme looks fresh and simple. It has a responsive design suitable all kinds of insurance companies. Impressive galleries and sliders ensure your website won’t go unnoticed. The theme has various blog styles, custom widget sets, custom theme options panel, and over 750 customizer options. 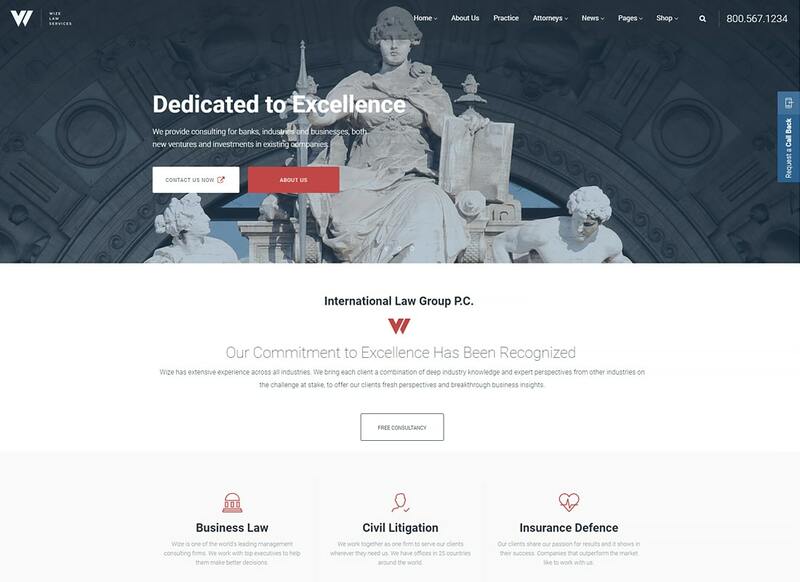 LeGrand is one of the most multi-functional attorney and law office WordPress themes. Its fresh design will improve any website. You will find lots of contemporary pages included All ready-made skins are responsive and Retina-ready. The theme includes social media widgets, buttons, beautiful icons, customizable blog feed, and a collection of Google Fonts. 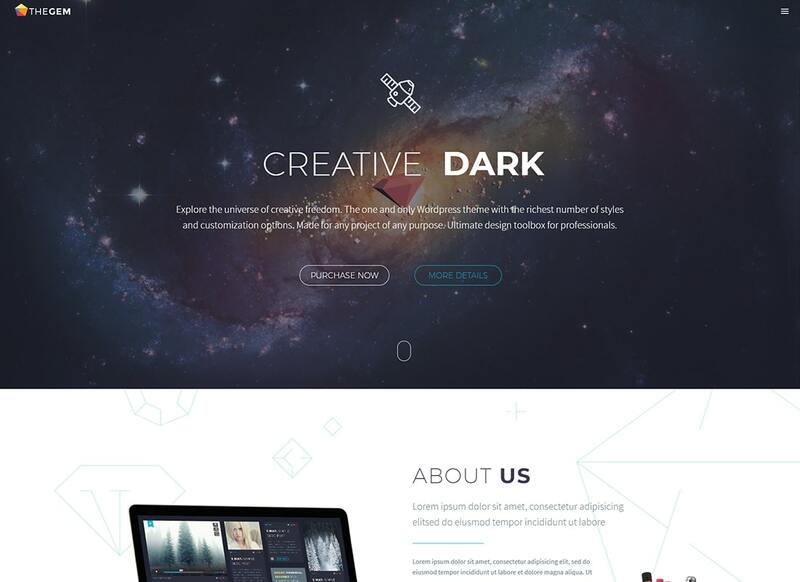 This theme is made with a high-quality HTML and CSS code. It has a responsive design and features lots of alluring pages suitable different business projects. It has ready-made pages for services and products. Apart from that, the theme is SEO-ready and supports WPML plugin. Also, there are 2 menu variations - pop-up with a slider and a classic one. Classter combines colorful design and tons of high-quality features. 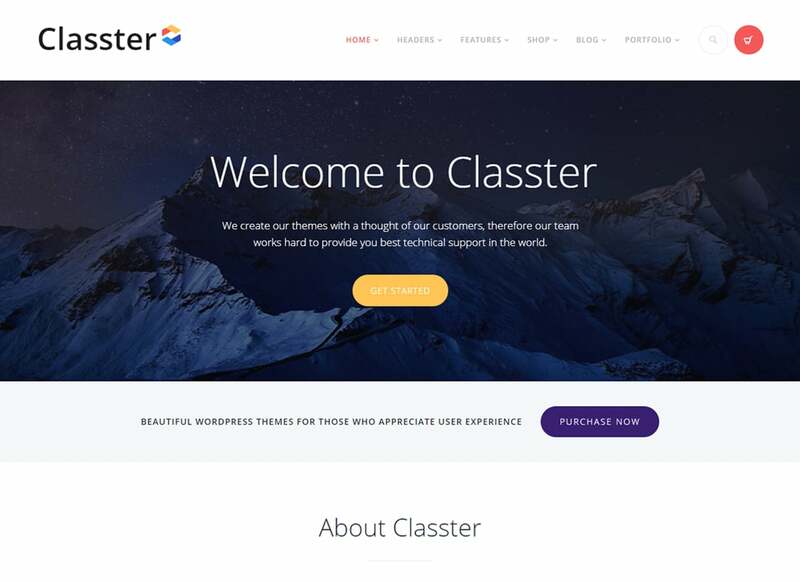 Some of the advantages you get buying Classter theme are the variety of premade styles and skins, over 20 portfolio styles, 15 blog styles, 8 predefined headers, Google Fonts, Fontello Icons, and tons of shortcodes. Also, there are 44 layered PSD files included. 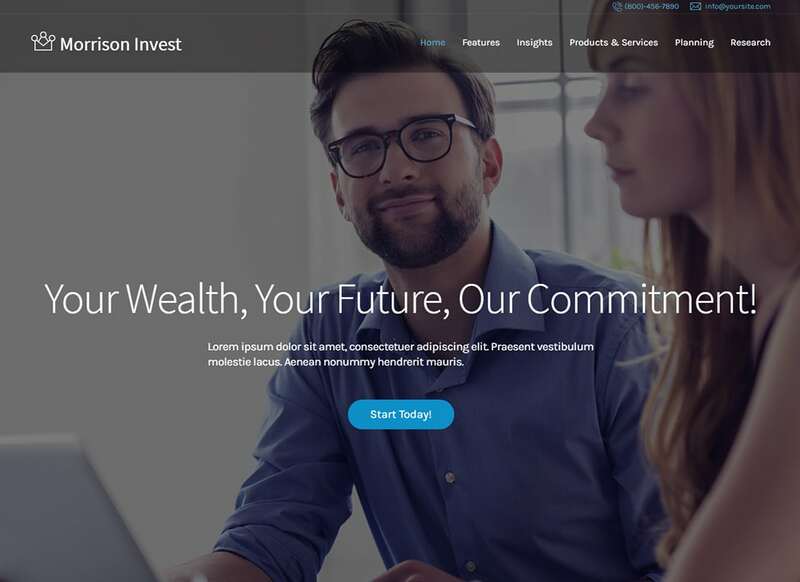 WealthCo is a beautifully designed WP theme for financial websites. WealthCo arrives great quality to any project with its sparkling look. The essential features of this theme are premade pricing tables, gallery management, ready-made services. Using WPML plugin you will easily translate your content into different languages. 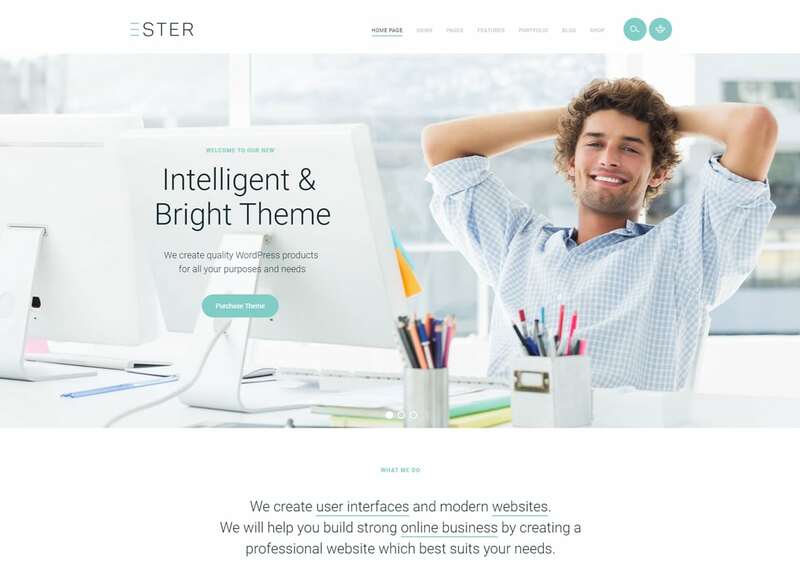 Ester has a fresh and fancy look which would work perfectly for a creative website. All the theme design is manageable by means of WPBakery page builder. What is more, the theme features ThemeREX Add-ons plugin, which provides you with an ability to use custom post types. Also, it has superb navigation options, such as main menu support and interactive Ajax search. Such features as Google Fonts, widgets, translation options will also come in handy. 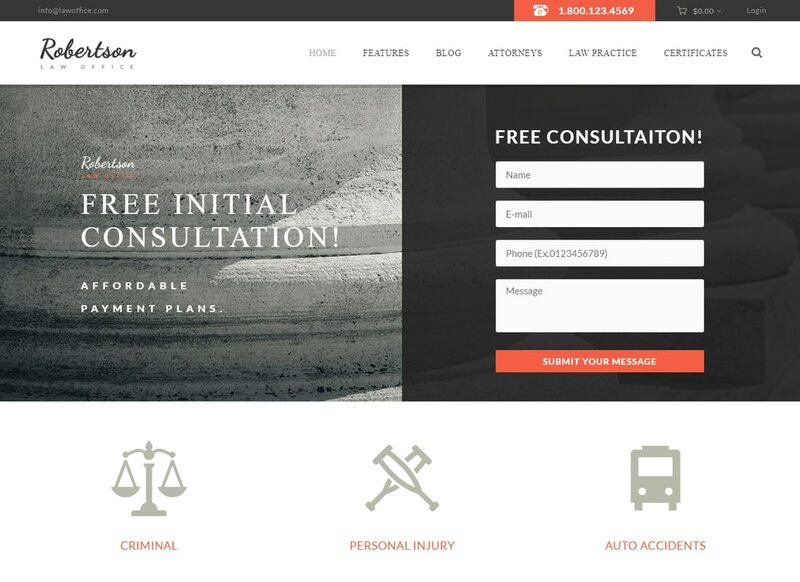 Wondering if there are any clean and simple lawyer WordPress themes available at a good price? 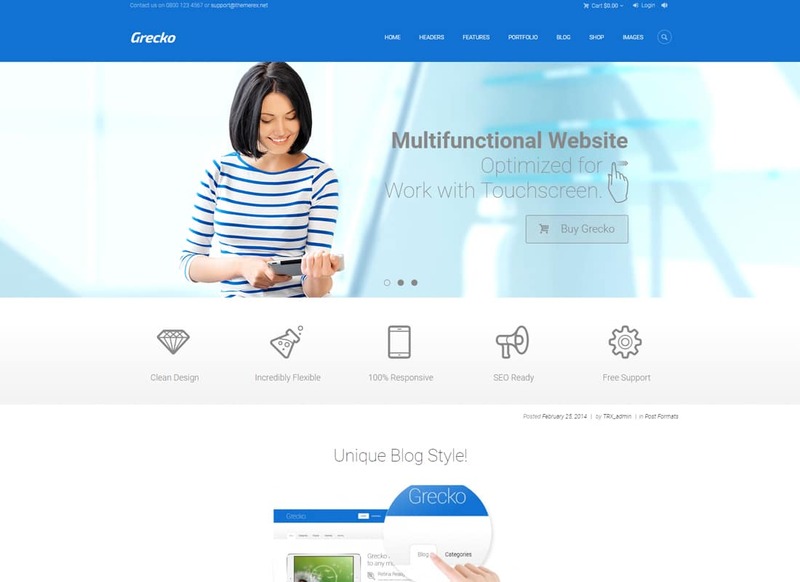 Take a look at the Grecko theme as we believe it is exactly what you need. It is fully responsive and stuffed with mobile-friendly sliders. 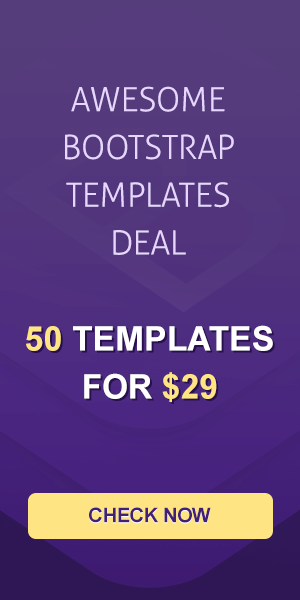 This multi-purpose theme counts over 100 shortcodes and widgets, 15 outstanding layouts, 40 hover effects, and much more. Wizor's is modern, stylish, mobile-friendly WordPress theme. It is a great choice for those, who want to refresh the website look and arm it with additional features. 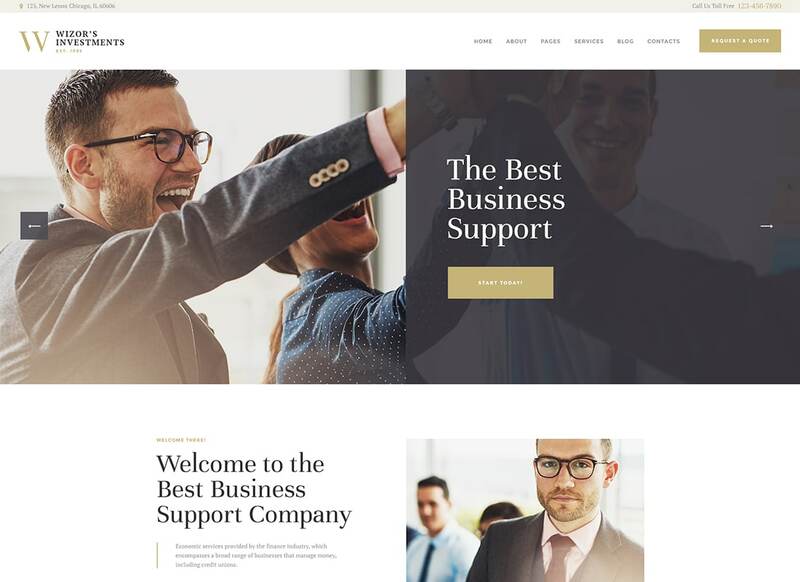 Wizor's theme comes built with a powerful framework and provides with 750+ customized options, custom post types, custom theme options admin panel, and many more. The SEO is already in the theme so you don't have to worry about the website ranking. Wizor's is an effective translation-ready theme for any business. Gordon theme will help you to demonstrate the key services you provide. For that purpose, it carries beautiful pages, galleries, and blog layouts. This theme will make your website viewable on all devices. It supports multiple premium plugins, such as WooCommerce which equips the website with e-commerce functionality. Thanks to the compatibility with WPBakery page builder you can make unlimited homepages. Use stunning blog styles to establish a remarkable content representation. This gorgeous WordPress theme has a completely customizable layout. Jack Well theme is built with HTML5 CSS3 code by the team of skillful designers and developers. Its powerful functionality provided by widgets, shortcodes, and custom theme options admin panel. 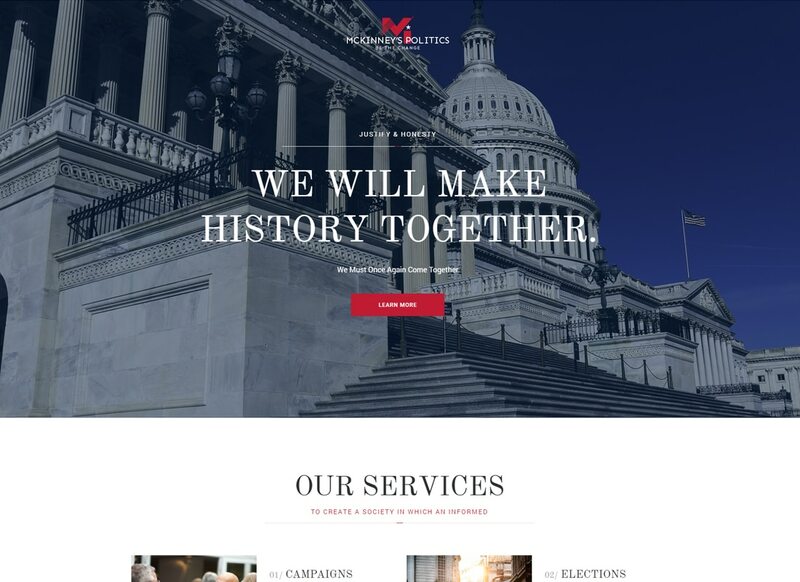 This theme will help you to show your team, services, and even run a political campaign. With its beautiful responsive galleries, you will demonstrate photos from meetings. With Unite theme you will build an alluring and remarkable online platform for a political or social company. This is a feature-rich theme that enables entrepreneurs to launch a professionally looking website regardless of his previous experience in web design. Unite features comprehensive theme options admin panel and drag and drop content creator. Also, it is compatible with several premium plugins, which equip the website with extra functions. ProParty is a political theme which has a versatile design that can be used for a variety of business fields. You may also select from a huge Google Fonts collection. use Fontello Icons, and play with the flexible color scheme of the ProParty theme. There are lots of social media options available which will only improve the political campaign. 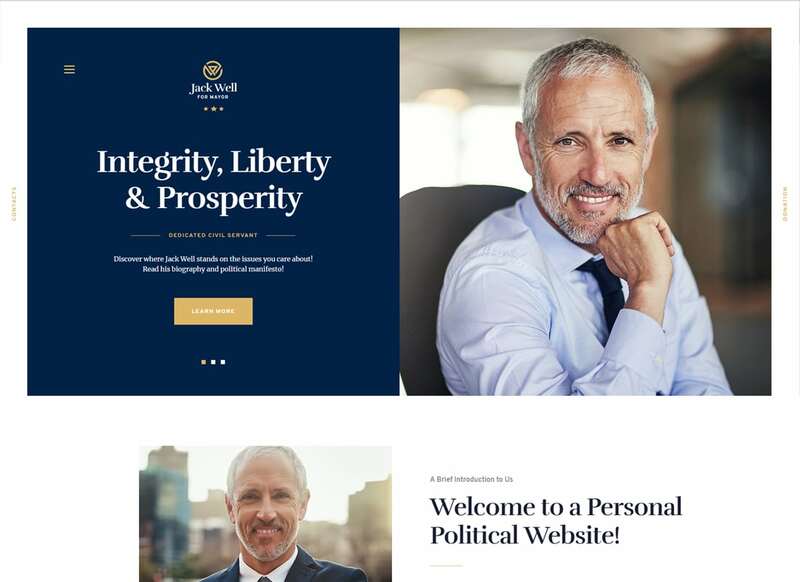 Looking for a decent theme for an election campaign website? 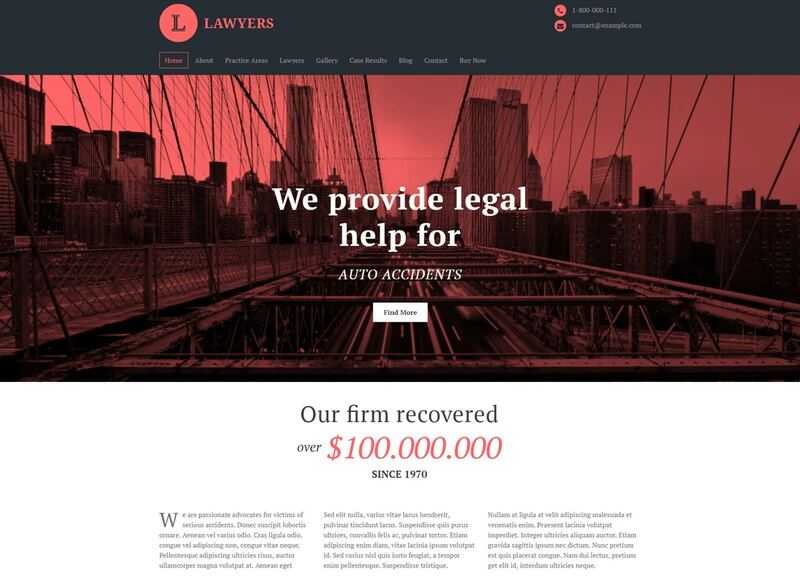 We have included plenty of gorgeous lawyer WordPress themes into this article. It has several graceful layouts that will help you to establish a professional representation of your candidate. Wide customization options of this theme provided by WPBakery page builder, Essential Grid, ThemeREX Add-ons, and other premium plugins. 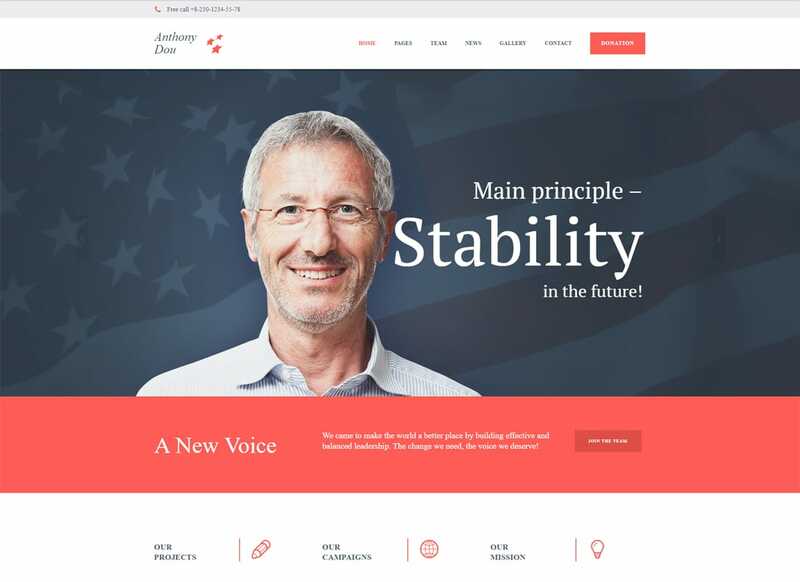 It is a must for a political website to spread vibes of reliability and the Candidate theme does. Its stylish contemporary design is made with clean and valid HTML5 and CSS3 code. This theme features online appointments booking option, online donations, handy social and political events management. There are 4 beautifully designed ready-made homepages, which you can use right away. 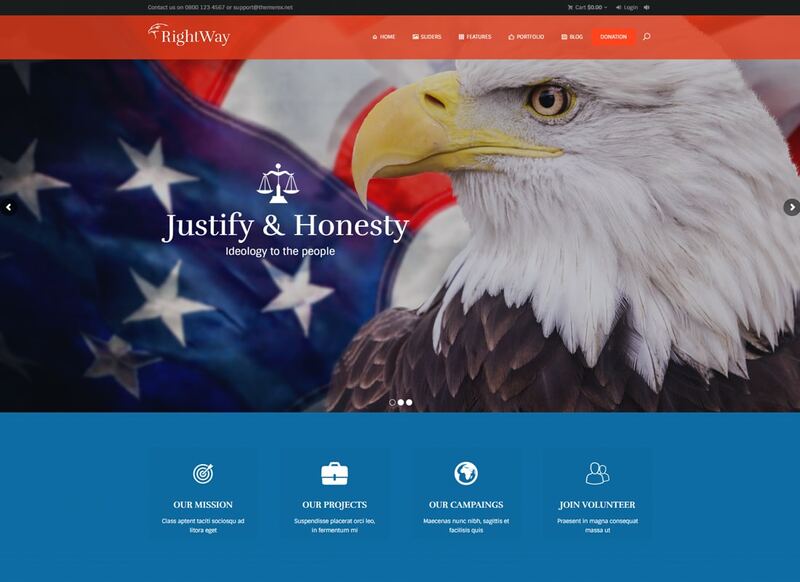 Modern and professional Right Way theme is a great solution for an online political platform. It has a dynamic design that is aimed to catch visitors attention with just one look. It would work great for lawyers, corporate business representatives, or social activists. It features plenty of ways for a remarkable content representation, such as outstanding ready-made galleries, customizable blog feeds, and responsive sliders. This gorgeous creative theme offers you over 376 demos at a ridiculous cost! Bridge is an absolute bestseller on Themeforest. It features all you might need to create dream content. Detailed video tutorials, extended social media options, smooth CSS3 animations, and easy to use admin panel are ready to serve you. As all premium attorney and law office WordPress themes, this one is bundled with the best premium WordPress plugins. 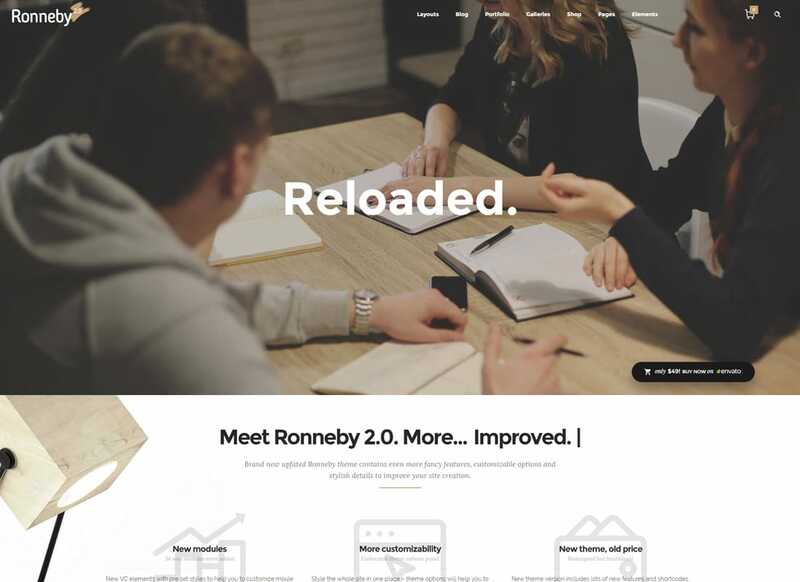 Ronneby theme was made to improve the performance of any corporate website, It counts 40 beautiful demos, all responsive and customizable. The theme features powerful and intuitive admin panel, shortcodes, top plugins, responsive settings, and advanced translation options. You can change everything in this theme, compose brand new pages, create galleries, modify blog layout thusly organizing your content in a neat and stylish way. The stunning design of The7 theme will receive the most enthusiast reviews from your visitors. It combines the simplicity of the drag-and-drop composer and convenience of powerful WordPress plugins. Smart typography and soothing colors will make your website look reliable and professional. 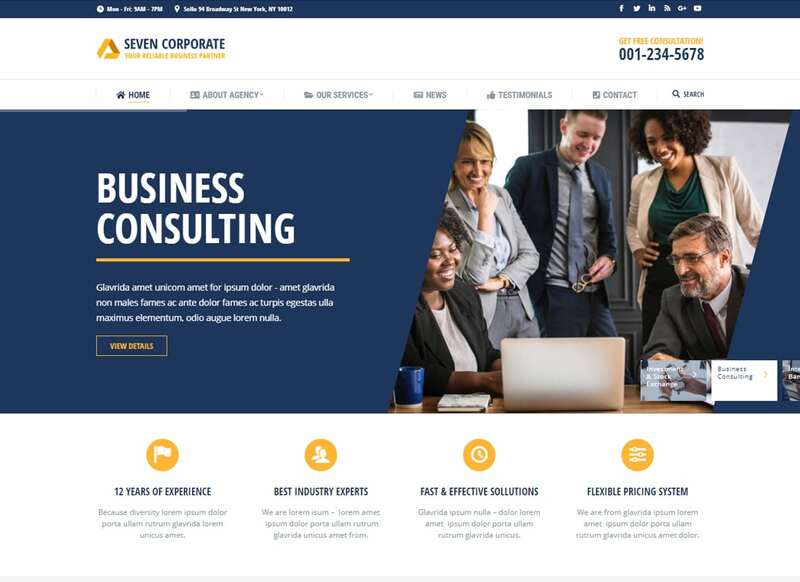 Improve the effectiveness of your website with the GoodLaw theme. 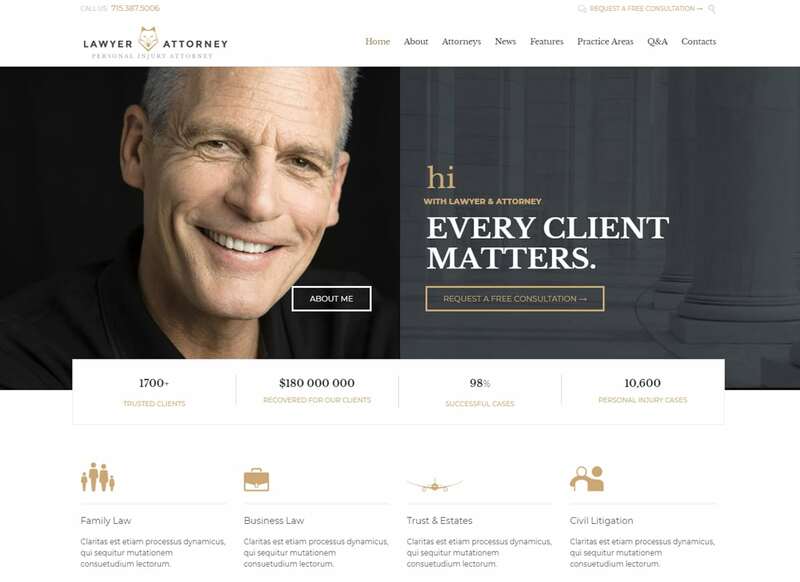 Anwalt is a classy theme for a law office website. Numerous shortcodes and widgets allow you to be more creative and craft custom design. This theme has a powerful framework, a huge pack of shortcodes, and a rich UI and UX kit. Anwalt theme is great for those, who want to create a design from scratch. 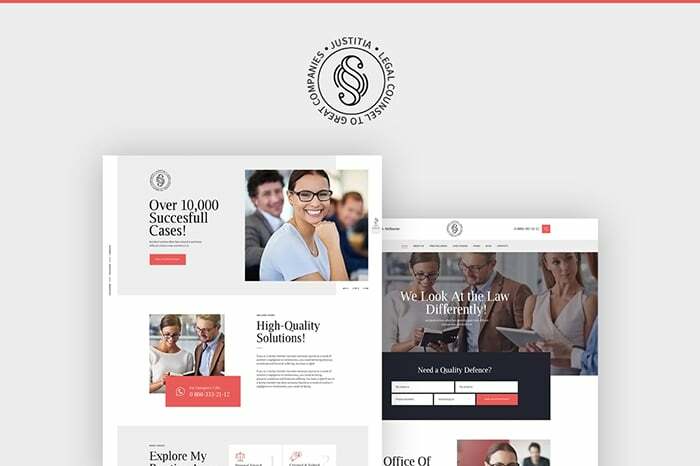 Smart and crisp Lawyer & Attorney theme is made for lawyers, counsels, and advocates needs. The drag and drop content composer is included with the theme for your best convenience. With this theme, you can launch a blog, which will attract more visitors to your website and help its SEO. This elegant WordPress theme features specific content that suits law niche websites. Even though the theme features ready-made pages, it supports WPBakery page builder, so you can create more of unique pages. With the Slider Revolution, you will make astonishing presentations and curry the favor of visitors at first sight. 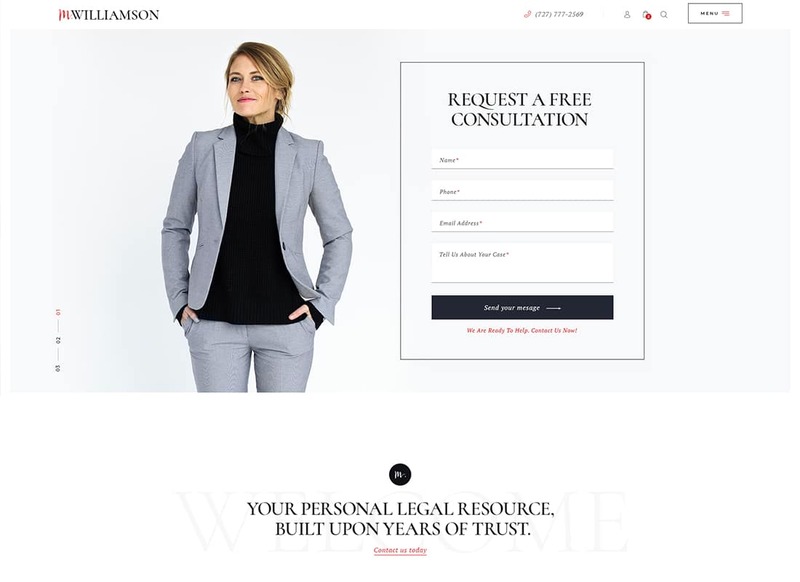 TheGem is one of the most creative attorney and law office WordPress themes. It has a business-oriented design, which is, by the way, supported by WPBakery page builder. It has stylish and responsive Swiper and Revolution sliders. The fast and simple installation process and handy customizer will save your time. 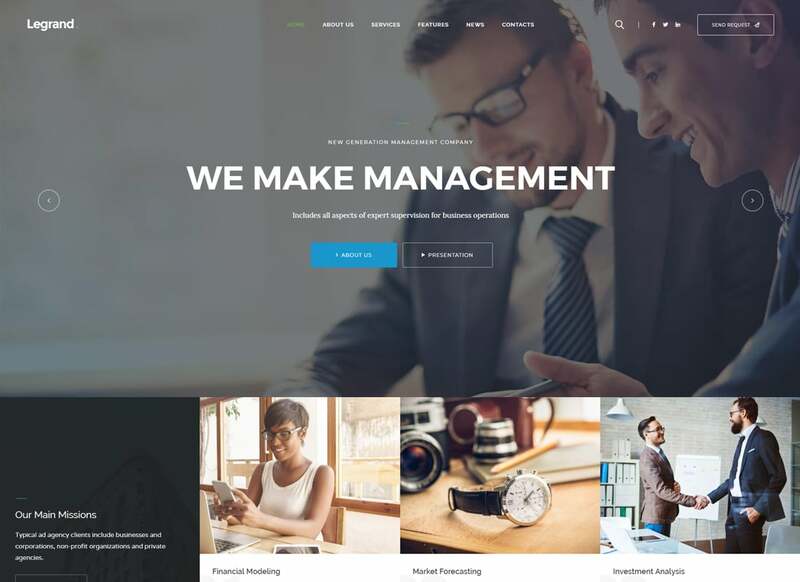 This WordPress theme would suit corporate, employment law, real estate law, family law criminal law, and other law sub-niches. This theme can be used as a blog as well, as there are multiple blog styles included and lots of useful blog settings included. All the ready-made content you get with this theme covers different aspects of attorney business. 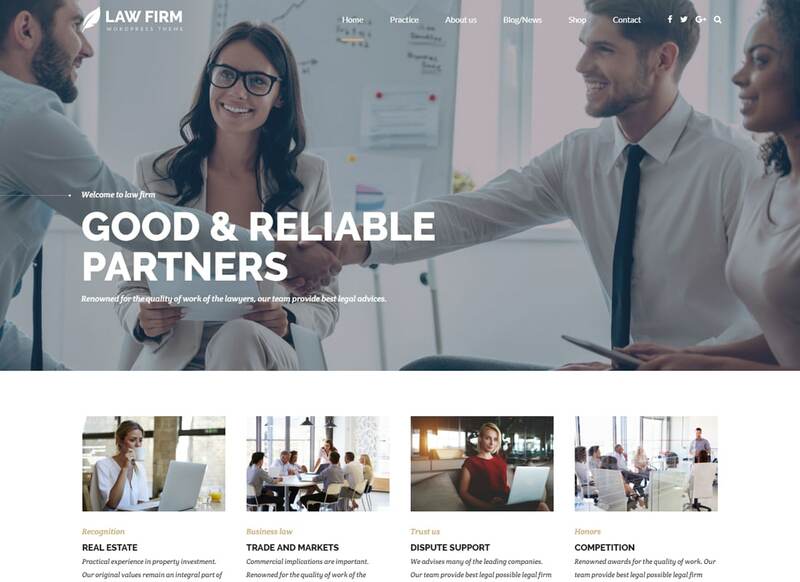 We would like to wrap this collection of versatile lawyer WordPress themes with this modern and trendy theme. You will get lots of ready-made pages and predefined modules. Clean and valid HTML code makes this theme efficient in terms of SEO. Using its intuitive customization tools you will achieve the best results with no efforts.